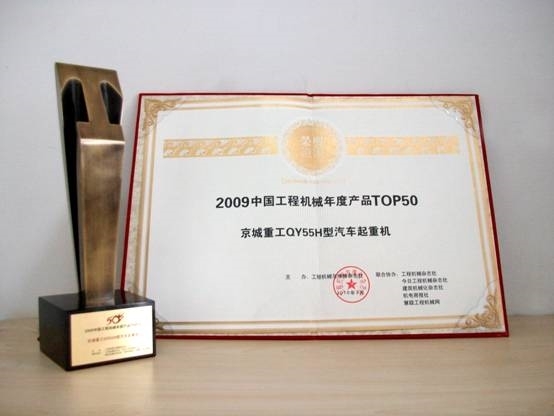 2009 China Top 50 Construction Machinery Products awarding ceremony was successfully held in Beijing on March 29, 2010. These 50 products represents the development direction of Chinese construction machinery technology and market. Guests from National Development and Innovation Committee, Ministry of Industry and Information Technology, China Machinery Industry Federation, China Construction Machinery Association, American Association of Equipment Manufacturers, end users and news media, all together over 150 persons attended this big event. China Top 50 Construction Machinery Products is sponsored by Construction Machinery & Maintenance Periodical Office. This event is aimed at better recording the development of Chinese Construction Machinery and promoting the development of Chinese construction machinery industry and its market. This year's event started at the early of 2010 and after three months' assessment by 33000 Internet votes, 200 users comments and 100 exports or insiders tests, 50 products stand out from the crowd. It is a great honor for JCHI to win the 2009 China Top 50 Construction Machinery Products.